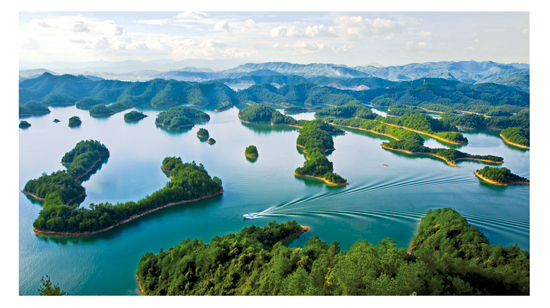 Thousand-island (Qiandao) Lake, also named Xin’an River Reservoir, is located in Chun’an county near the city of Hangzhou, Zhejiang province. It is a man-made lake backed up by a hydropower dam on the Xin’an River that offers a quiet place for respite with its verdant mountains, crystal-clear waters and islands. When the reservoir filled up, the remaining hilltops formed many islands, hence the “Thousand-island Lake”. It has an average depth of 34 meters and clear water with a visibility of around 10 meter and has a national first-class lake rating and many well-known bottled water brands, such as Nongfu Spring. Work on the reservoir began on Aug 20, 1956 and it began impounding water in September 1959, inundating parts of Chun’an and Sui’an. The hydropower plant was established on April 22, 1960 and began generating electricity with its 72,500 KW electric generator. 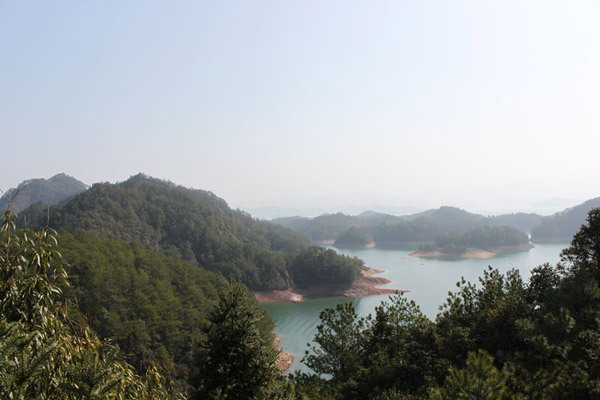 The Lake scenic spot covers 95,000 hectares, with 41,700 hectares of hilly land, 53,300 hectares of water surface, and 17.8 billion cubic meters of water storage. The lake and its islands are the perfect integration of beautiful scenery, mountains, water, and forests. A thorough study of the area has shown 1,830 species of plants, including 810 species of woody plants, 498 species of wild flowers, and 18 species of national protected plants. The forests are the result of natural forests and forestation and the abundant plants provide scenery and habitat for various wild animals. 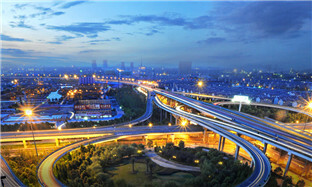 The county was a thoroughfare and prosperous and populated in ancient times and even after the inundation by the reservoir in 1959, Chun’an and Sui’an merged to better preserve themselves. The scenic spot boasts Blossom Mountain, Stone Forest, Longshan Island, Peacock Island,Yule Island, getting 5A national scenic spot designation in 1982.